I have applied for a UK visa twice and i got a rejection the first time was in 2013 and the rejection reason was the bank statment and that i was outsourced for Pfizer and provided an HR letter mentioning that i am worki g as a contractor for Pfizer however i mentioned in the application that i work for Pfizer . The second time i applied i got a rejection and the reason was that i said in the application i worked for pfizer as a headcount "permenant " resource sine july 2016 however when he searched for a history he found my old application that is mentioning april 2013 . I amattaching a copy from the rejction letter , and i need an advice on what to be done to get the visa as i am afraid to apply for the third time and get a rejection . The letter is quite clear. They did not see any evidence that supported your assertion that you work for Pfizer. They also did not understand that the nature of your employment with Pfizer changed in 2016. Submit a new application, including evidence to show that you work for Pfizer as an employee, that your employment on those terms began in 2016, and that you worked for Pfizer before 2016 as a contractor. Not the answer you're looking for? Browse other questions tagged visas uk egyptian-citizens visa-rejections or ask your own question. UK Visa - will we get it? 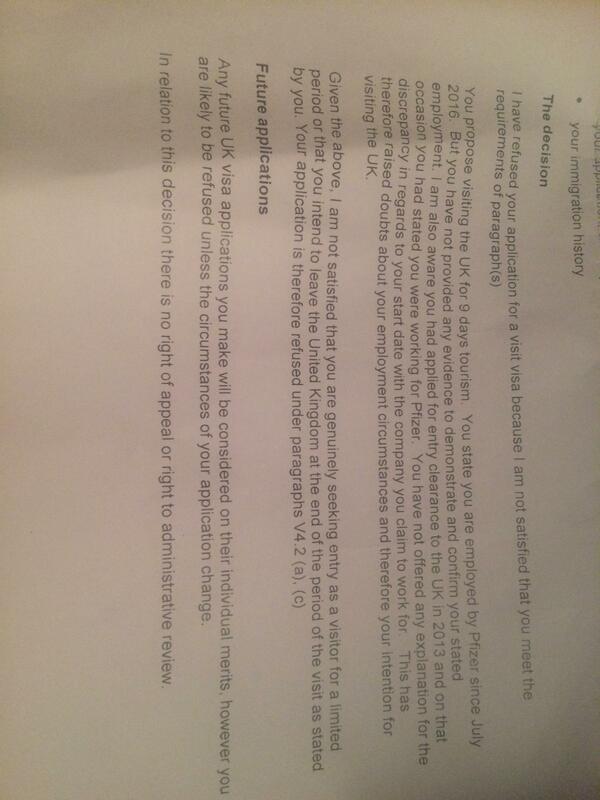 UK visit visa refused twice due to unsatisfactory bank statements. How to reapply? Iran visa rejection - should I bother reapplying?